Bottlenose Dolphins grow to an average length of 3.1 to 3.7 metres (10 -12 ft) and are usually seen in groups of 3-10, although sometimes larger. Dark to muted grey along the back and sides with a pale stomach, they are playful and sociable and can regularly be seen leaping. Females reach sexual maturity at around 11/12 yrs and give birth between April and September to a single calf. Their diet consists of a wide range of schooling fish, bottom dwelling fish and squid. Where might I see them? Bottlenose dolphins are seen all year round in Cardigan Bay. The number of individuals increases during the summer months and into autumn, reaching a peak in late September and October. 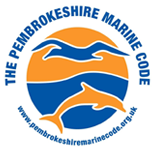 Our most regular sightings are between Cardigan Island and Mwnt and off Aberporth Headland. 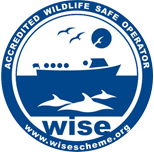 Find out more about Dolphin Watching in Cardigan Bay. The harbour porpoise is a very shy animal and only show their backs and dorsal fin when surfacing the water. They are seen singly or in small groups of 2-3 animals. One of the harbour porpoise's names, the puffing pig, is derived from the noise of its blow when they surface the water for air. The noise made sounds like a human sneezing or puffing. They appear dark grey from surface, although sides are lighter and have a pale stomach. Sexual maturity is reached at three to four years with females giving birth between May and July to a single calf every 1-2 yrs. Their diet consists of varied fish and crustaceans including Herring, Mackerel and Sand eel. Harbour Porpoise are seen all along the Cardigan Bay coastline but our most regular sightings are between Cardigan Island and Mwnt and off Aberporth Headland. Males or ‘bulls’ grow up to 2.7m and are generally darker than females or ‘cows’ that only grow up to 1.7m. Pups are white at birth, but turn a greyer colour within the first few weeks. They have a streamlined body, with a large nose & eyes. They can often be seen surfacing near the shoreline while hunting and feeding but also go out to sea for long periods. Seals will dive for around eight minutes when foraging for food, but while at rest, or asleep, they may remain submerged for up to 13 minutes. Their diet consists of fish, crustaceans and molluscs. Females reach maturity at 5-6 yrs, giving birth to a single pup between September and December every year and have them ashore on the Bay’s secluded beaches and in sea caves. Usually seen individually in water or in small groups hauled out around Cardigan Island or on the beaches around at Cemaes Head. Cardigan Island is an important nesting area for seabirds. Particular favourites are Razorbills & Guillemots, both members of the Auk family and closely related to Puffins (which we don't have any of). They spend their life out at sea only coming to Cardigan Island to have their young each year in the Spring & early Summer. The Island is home to a large number of Gulls including Herring Gull & it's more unusual relative the Lesser Black-backed Gull and not forgetting around a dozen pairs of the enormous Great Black-backed Gull. Other birds you may see in the Island include Shags, Cormorants, Fulmars, Oystercatchers & Chough. Peregrine can often be seen at Cemaes Head & our favourite are Gannets, whose spectacular plunge diving is often a signal that Dolphins are in the area.